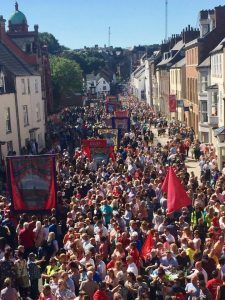 On Saturday, 14th July 2018 we will be running a free trip for our members and their families to the 134th Durham Miners’ Gala. 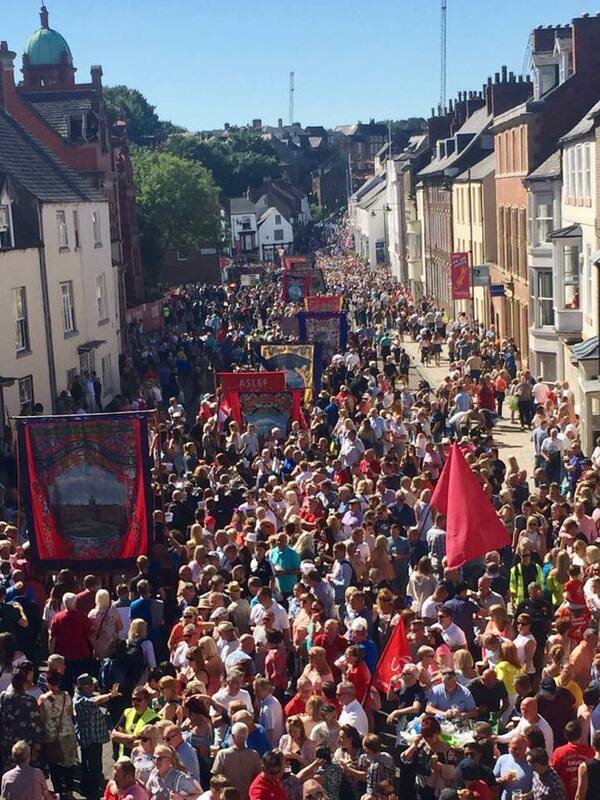 If you and your family would like to come along, please print, complete and return a UNISON Durham Miners Gala trip 2018 form to the UNISON office (address below) along with a £5 deposit per person (this will be refunded on the day of the trip) by Thursday, 12th July. Once again we will be coach-sharing with Kirklees UNISON. The Leeds pick up will be approximately 8.15am behind the West Yorkshire Playhouse, with additional pick-ups in Huddersfield and Dewsbury (times TBC). The coach(es) will then drop you in Durham for the whole day so that you can make the most of the Gala before being picked up at 5pm, arriving back in Leeds at approximately 6.30pm. The Gala is not like a normal trade union march. In fact, it has no start time, no finish time and no one place of assembly. Traditionally, the colliery bands would march though their villages starting early in the morning and the make their way to Durham from all directions and, in the main, that tradition remains today. The main assembly point is the city centre Market Place and bands and banners start to march from there to the Racecourse from about 8.30am. Other assembly points are the Miners’ HQ at Red Hill near the railway station and the New Inn on the west of the city. The focal point of the Gala is the County Hotel at Old Elvet where the two legs of the procession converge. Here, the union leaders, invited guests and local dignitaries greet the march from the hotel balcony and the bands pause to play their “party piece” before marching the short distance to the Racecourse where there is a platform for the speakers. The procession can take three to four hours to pass the County Hotel due to the huge numbers attending and the frequent pauses at the hotel. However, a wonderful atmosphere of street theatre is created there making the occasion more of a fiesta than a march. On the Racecourse, the banners are strapped to the surrounding fences creating a colourful tapestry of working class history. On the riverside, there are rides for the children and stalls selling everything from books to fast food. In the marquees, there are many exhibitions and a place where tea and sandwiches can be bought (run by the Durham Labour Party). And, on a field overlooking the racecourse, there is a fun fair with some scary rides for the more adventurous. At 1pm, the platform party arrives and the Chairman opens the meeting. After the speeches, four or five selected bands and banners march to the Cathedral for the Miners’ Service. Whether you are a believer or not, this is worth a visit for the sheer dramatic experience. Back on the Racecourse, the banners are lifted when the various miners’ lodges decide it is time to go and march back to the County Hotel where they play another tune exuberantly but, sometimes, a little less professionally due to the intoxicating effects of the day’s celebratory atmosphere.